Earned links, with earned links to them, are the best way. Some multi-tier link building techniques are spammy and use paid or low-quality methods. But there are ethical ways to do it too. When performing SEO, sometimes earning just one link to a web property won't do the trick. A chain of links to the target can show a strong value chain that is often rewarded in search engine results. For example, many times a link will be built to promote a particular page, but the link isn't very strong. It's not strong because the inbound link may also not have links to it. In this diagram we will refer to the main page we want to promote as "Tier Zero". The content / link structure to promote an existing Tier Zero web property is illustrated below. 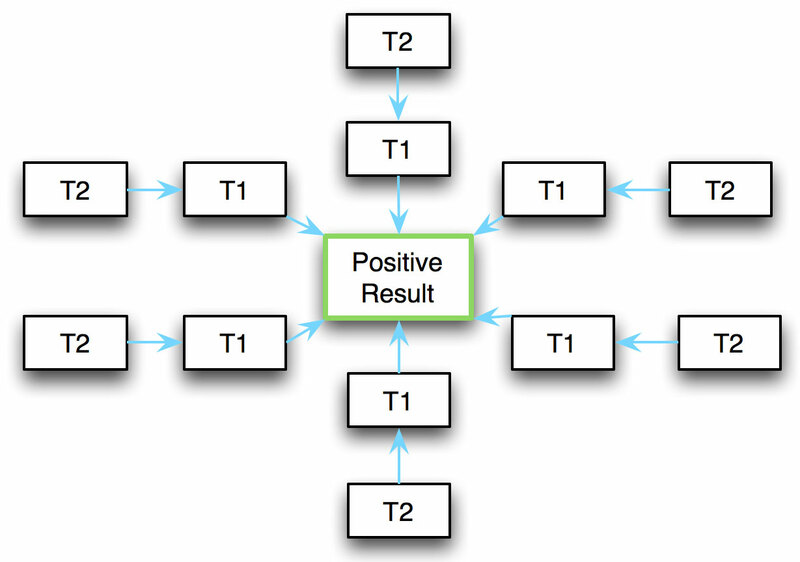 At the center is an existing Tier Zero result (Tier Zero is labelled "Positive Result". It is named Tier Zero because it exists at the center of a web (or wheel) of content and inbound links. This example diagrams an example of a positive we wish to promote that already exists for a financial services firm specializing in investing. For this example we will assume it is the LinkedIn.com page for a company in the UK with the following URL: www.linkedin.com/company/acme-investments-uk . This is link building for reputation management, so let's also assume a negative search result exists above the LinkedIn.com profile in search results and that our objective is to promote the LinkedIn profile above the negative. Our objective is to improve the content of the Tier Zero page, but also to promote it with a two-tier earned link structure. The best structure is an organic one, that is - one where the posts linking in are not paid for but happen organically - earned. Content Type: Blog Post, Evergreen (Evergreen blog posts are not time sensitive and do not decay as fast as say, news. Notes: Should contain relevant data. Headline should be "click bait" to some extent. Must be highly relevant to investors and other stakeholders in the financial services community. The content for this tier, like all content, must be compelling and helpful to the user. Notes: The various T-2 pages should be a mix that can include a press release (not about the client), guest post, paid link, or other types of inbound link generating content. They cannot be directory listings or similar low-quality content. Both T-1 and T-2 content will be promoted via sponsored Tweets, Facebook ads, StumbleUpon ads, etc. Therefore the headlines and content must be compelling, real, and relevant as our objective is to generate Likes, Shares and Links organically.